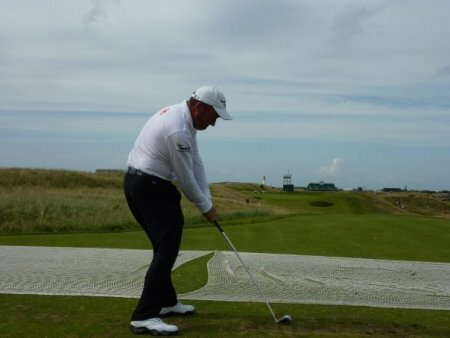 Super professional Damien McGrane is blocking out the major hype in his second successive Open start. The Kells man, 38, has vowed to treat the world's biggest major as "just another tournament." McGrane is ready for the grindHoping to improve on his debut at Birkdale last year, where he missed the cut by a shot, McGrane said: "I am not trying to knock the tournament, it is lovely to play in a British Open and lovely to compete and hopefully play well. "But it is still a case of hitting fairways and greens, no matter how you look at it. To be honest I think it is a tournament like any other. "That's the way I approached it last year. Okay, it's all a big doo-dah for the press but it is all the same old same old for me. "This week the priority is to hit straight shots and deal with the wind. When I am standing on the 18th tee box, my priority is to hit the fairway and not the fact that it is the British Open." Ireland's top finisher in last week's Scottish Open at Loch Lomond, McGrane is concentrating on putting in a good performance in Scotland. A former apprentice at Portmarnock, he knows how to get around a links course and rates Turnberry as a serious test. He said: "The rough is extreme but you deal with the conditions each week as you find them. You have to do all the right things and hit plenty of good golf shots and you will have a chance. "Okay there is a bit more hullabaloo but it is the same as any other week. If you play golf for a living, it is a four round tournament and you rock up and hope to play well." Debut boy Damien McGrane reckons there could be Zulus hiding in the rough at Royal Birkdale. The grass is waist high in places at the Southport track and the Meath man want to avoid it at all costs when he tees off in the 'Zulu Dawn' patrol with Jerry Kelly and Darren Fichardt at 7.03am. Anxious to make his Major debut at last, McGrane said: "It is a tough track. There are a lot of tough holes out there and you have to hit long, straight tee shots. "If you play well, you will do well and if you don't you will get hammered, especially by the rough. "I haven't lost the bag in it yet and I haven't see any Zulus out there yet either. Damien McGrane putts on the fourth green during the final round of The Celtic Manor Wales Open. (Photo by Eoin Clarke/GOLFFILE).Damien McGrane admits must take a leaf out of Darren Clarke’s book and remain patient as he battles for his European Tour survival. The Kells man, 40, is a lowly 102nd in the Race to Dubai standings with only the top 115 set to avoid a trip to the Q-School in December. Damien McGrane is keen to regain his lost confidence by making an early start to the season in South Africa this week. Photo Eoin Clarke/www.golffile.ie Damien McGrane is so keen to forget about his 2011 nightmare that he’s starting 2012 as early as humanly possible by teeing it up in this week’s season-opening Africa Open in South Africa. In fact, the 40 year old from Kells will play five tournaments in the next six weeks as he bids to rediscover the putting touch that deserted him last season and almost cost him his card.